The death toll in the Philippines, where the main island of Luzon was mauled with fierce winds and rain, rose to 65 overnight as rescuers pulled more bodies from a huge landslide in the mountain town of Itogon. National police spokesman Senior Superintendent Benigno Durana said that 43 other people are missing, and more than 155,000 people remain in evacuation centres two days after the typhoon struck. After tearing through Luzon and pummelling Hong Kong and Macau, the storm made landfall in mainland China late yesterday (Sept 16), with two reported dead in Guangdong province. Authorities there said they had evacuated more than three million people and ordered tens of thousands of fishing boats back to port before the arrival of what Chinese media had dubbed the ‘King of Storms’. 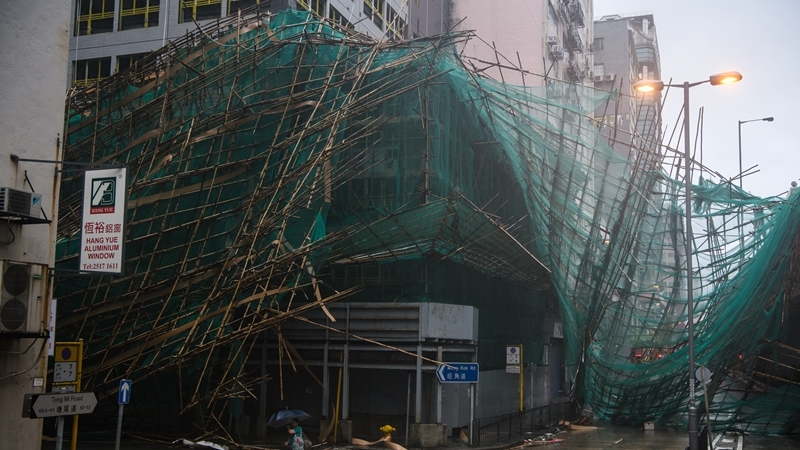 In the high-rise city of Hong Kong, the government described the damage as “severe and extensive” with more than 300 people injured in Mangkhut which triggered the maximum ‘T10’ typhoon alert. The monumental task of cleaning up the city began as residents, some in suits and ties, struggled to get back to work on roads that remained blocked by felled trees, mud and debris. Schools were closed, along with bus services, and travel disruption saw commuters piling onto platforms trying to board infrequent trains after trees fell on overhead lines. Landslides and severe flooding affected some areas, with over 1,500 residents seeking refuge in temporary shelters overnight. The storm, with gusts of more than 230 km/h, sent buildings swaying and waters surging into homes and shopping malls, with some roads waist-deep in water. Windows in tower blocks and skyscrapers were smashed as people cowered inside. In the neighbourhood of Heng Fa Chuen, thousands of rocks and pebbles from the sea covered parkland along the coastline which had been battered by pounding waves. The city’s main Victoria Park had become an obstacle course with hundreds of trees down and many completely uprooted. Emergency teams were sawing apart some of the biggest trees blocking roads and pathways across the city in a clean-up operation that is likely to take days. In the neighbouring gambling enclave of Macau, all 42 casinos shut down for the first time in its history as the storm approached. They opened again today but Macau was still in recovery mode after severe flooding hit parts of the city, forcing emergency workers to rescue people from their shops and homes using boats and jet-skis. As the storm moved past the enclave yesterday, streets became submerged under water gushing in from the harbour. The government and casinos have taken extra measures in recent times, determined to avoid a repeat of Typhoon Hato which battered Macau last year, killing 12 people and drawing accusations it was ill prepared for a major storm. During a lull in the storm we went for a quick walk in Victoria Park to see the damage, it was pretty intense. When the wind picked back up and we could hear the trees cracking we decided to head home. Was a big old storm, loads of damage outside where we are staying.